Delighted to announce our Champion Heartstrings Mambo x Champion Heartstrings Shirley upcoming babies! An exciting pairing, puppies are due late April and we will be committing/accepting 2 advance deposits for companion homes. Additionally, we are interested in working with families in Ohio and contiguous states on “show contracts” whereby we can watch and see how our top litter picks turn out and retain the ability to show the puppies. Please contact us to discuss. 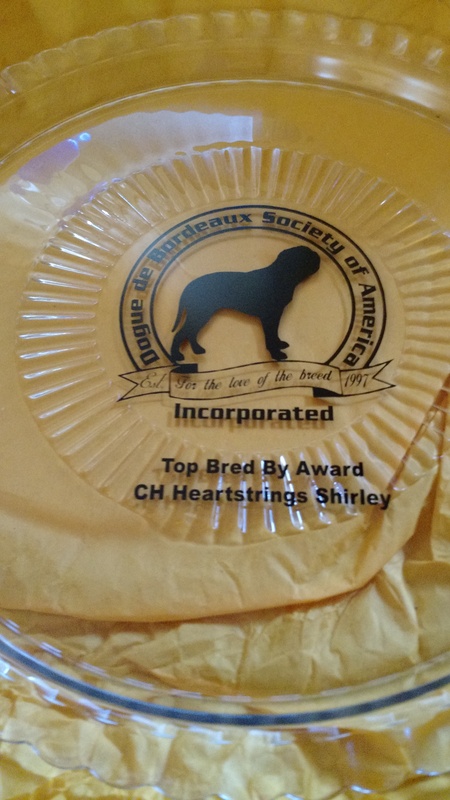 Shirley Championed 2014 out of the Bred by Exhibitor class. She also received the 2014 DDBSA Top Bred By award from the national club. Shirley is CHIC health certified. This is her 2nd litter and what a great mama: we are watching her 2015 babies come along famously and are excited that at least 4 of the puppies will start show/working careers later this year. 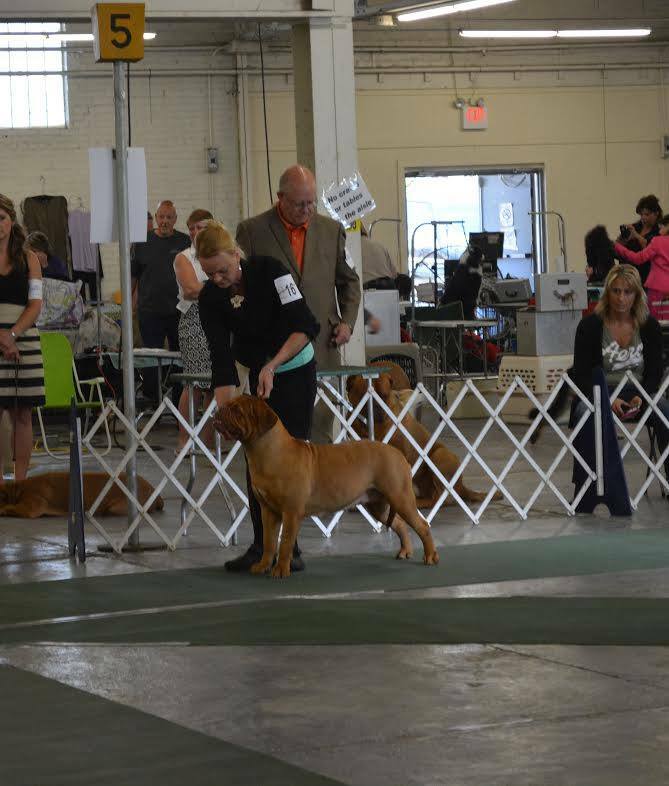 Mambo Championed 2015 out of the Bred by Exhibitor class as well and is working towards his Grand Championship. 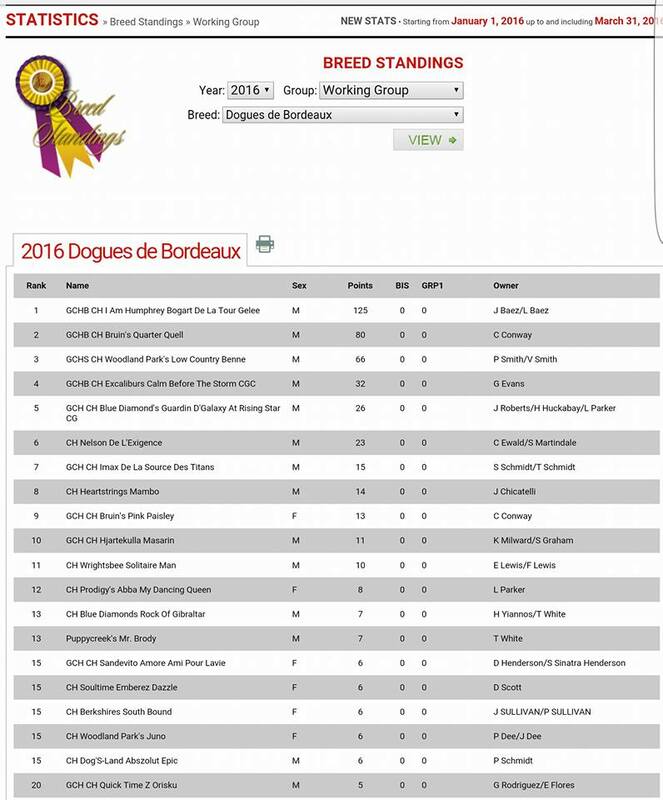 He finished in the US Top #10 in the National Owner Handled Series and with very light showing so far 2016, is currently ranked #8 DDB in the US in Breed Standing. Clear heart on echocardiogram by Dr. Schober, chief cardiologist and department head of cardiology at Ohio State School of Veterinary Medicine. We will be home on maternity watch but 3 of our Dogues, including Mambo, will be exhibiting in Columbus OH 04/23, 04/24. The address: Ohio Expo Center at the Ohio State Fairgrounds. 717 East 17th Ave, Columbus OH 43211. Saturday 04/23 ring #4, 8:00 am. Sunday 4/24 ring #4 at 10:15 am. Nice entry – 11 DDB’s Saturday, 14 DDB’s Sunday. A great opportunity to meet and see 3 of our boys who live all around Ohio in the ring and hopefully we will be cheering some great results! Champion Heartstrings Mambo is currently ranked #8 DDB in the US in Breed Standing (01/1/16 – 03/31/16). 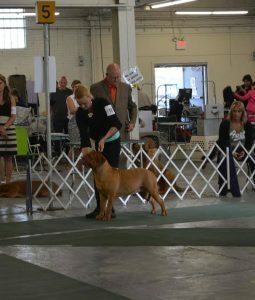 Extra exciting: Mambo has only been to 2 shows so far this year “just for practice” where he was rewarded with Best of Breed wins! 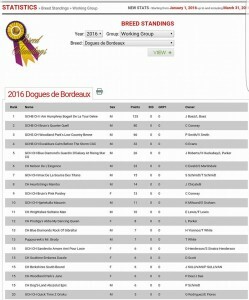 Recall he has been shown lightly, but still managing to finish 2015 in the US Top #10 of the National Owner Handled Series. He creeps closer and closer to Grand Champion, having earned many of the requisite points and 3 of the 4 required Major Wins. Mambo will be exhibiting in Columbus, OH April 23 & 24. We are hoping for exciting show results and will post the ring times and numbers here when they are available. A beautiful photo of Heartstrings Vauquios RN captured by photographer Mark Plonsky. Breathtaking photo. You wonder what those beautiful amber eyes have to say, you can almost feel that soft, velvety fur or his ticklish funny whiskers. 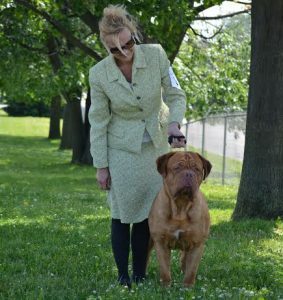 As some breeders make choices to manipulate head type, perhaps to shorter muzzels, perhaps to “rounder heads” or whatever the market demands, we stay true to breeding the correct Dogue de Bordeaux consistent with historical and empirical data. 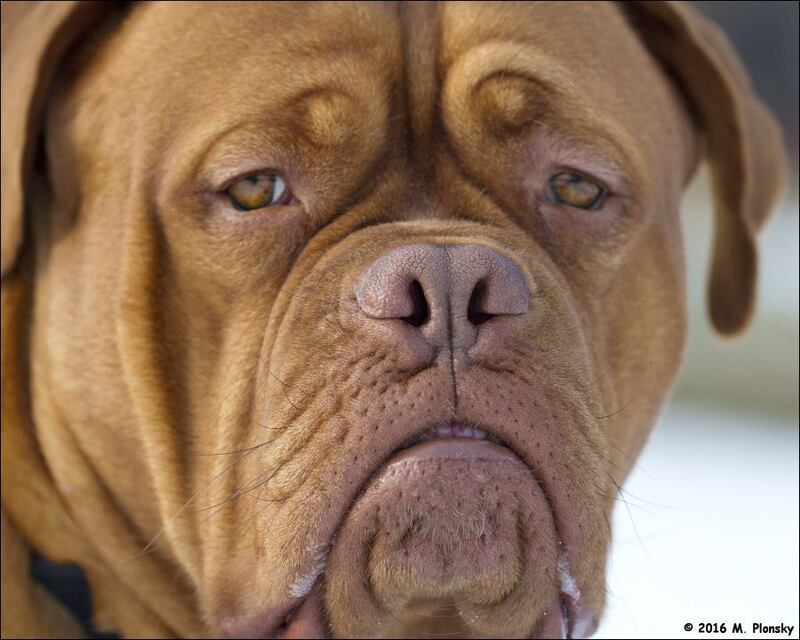 Our mission has been to stay in keeping with the beautiful athletes that our breed embodies. Vauquois is a wonderful representation. Again very subtle, but something as simple as nostrils getting larger instead of smaller, tighter is very satisfying. One look, Vauquios screams – “I was bred to do my job as history has set forth. I am an athlete. Despite my size I can work and do my job all day.” Well done, Vauquois, you make us so proud! Jazzy x Mambo x Popeye Babies Have Arrived! Dual-Sired Litter. No friends, this is not an April Fool’s joke. In this case three *is* company. The puppies from this litter are spoken for, but we wanted to take some time to explain the rationale and process behind dual-sired breedings. Understand that we breed first and foremost for ourselves and the furtherance of our program. 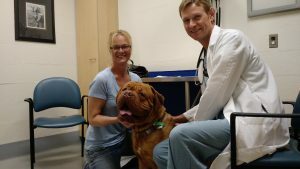 We “keep” from every litter with an eye towards the future – minimally a “5-year plan” involving a complex matrix of pedigrees, ongoing health tracking and carefully calculated coefficients being the scientific basis behind choices. Then the right-brain factors; the art, craft, the fine-eye of the movement for example – will the puppy grow, speak to us and one day make the cut into our elite breeding program? A girl in our program will have minimal litters so we must choose very carefully and wisely. We begin with finding the best possible male(s) as matches. A dual-sired breeding choice gives us the ability to see and watch what our girl will produce when paired with different Sires and Lines. To us, it is ideal on a girl’s first litter. Shortly after birth each puppy is dna’d. This is a non-invasive process involving a cheek swab with what looks like a mascara brush. The kit on each puppy is mailed off then we wait for results and try to avoid guessing. The puppies could be from either sire. The puppies could be from both sires, which is optimal. There is nothing economically practical about dual-sired breedings. It is a long wait for the DNA results which we rely on to make careful choices for the future. It is expensive; the DNA kits, the insemination, potentially double stud fees, up-charges for registration being the short list. 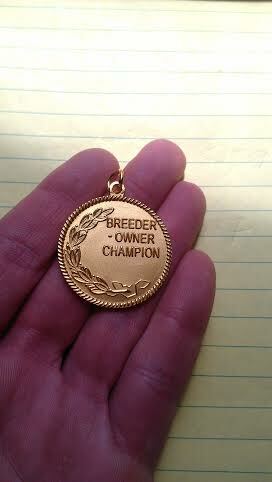 But as “preservationist,” “craft,” or “artisan” breeders…dual-sired is an easy choice.